I seem to have gotten myself on Senator Joe Biden’s mailing list. Unlike the rest of the spam that turns up on my account, I usually click on Biden’s links to see what he has to say. Although Biden is widely believed to be running for president, he never says anything about that. Usually he has something to say about Iraq, which makes me wonder if the buzz about his presidency isn’t just to make people pay more attention to the policies he’s advancing. This week Biden addresses the problem of recommendations from the bipartisan Baker-Hamilton Commission that everyone is waiting for. The more cynical say the commission is to spread the Iraq blame around some so legislators will be more likely to vote on some legislation. Biden makes the following points in an op ed piece in Sunday’s Washington Post. Our current policy in Iraq is a failure. We are past the point of an open-ended commitment. We are past the point of adding more troops. We are past the point of vague policy prescriptions. It is not an answer just to stay. Nor is it an answer — though it may become a necessity — just to go with no concern for what follows. The fundamental question we must answer is whether, as we begin to leave Iraq, there are still concrete steps we can take to avoid leaving chaos behind. Six months ago Les Gelb, president emeritus of the Council on Foreign Relations, and I proposed a detailed answer to that question, which can be found at http://www.PlanForIraq.com. We had two fundamental premises: first, that the main challenge in Iraq is sectarian strife, for which there is no military solution; second, that putting all of our chips on building a strong central government cannot pay off because there is no trust within or of the government and no capacity on the part of the government to deliver basic services to the Iraqi people. We argued instead for a strong federal system, as provided for in the Iraqi constitution, that gives its main groups breathing room in regions while preserving a central government to deal with truly common concerns; a fair sharing of oil revenue to make those regions economically viable; a jobs program to deny the militia new recruits, and a major diplomatic effort to secure support for a political settlement from Iraq’s neighbors. Biden calls for a phased troop withdrawal without a hard deadline, a sustainable political settlement that deals with federalism, sharing oil revenue (especially with the sunnis who have no oil in their region) and the militias, and the involvment of all of Iraq’s neighbors in the political solution. There can be no sustainable peace in Iraq without the support of its neighbors, including Iran, Syria and Turkey. All major Iraqi factions should be included in the conference — and, as at the Dayton Conference for Bosnia, we should keep them there until all agree to a way forward. Biden is also calling for hearings in the Senate Foreign Relations Committee, in close collaboration with Republican Sen. Richard Lugar. These intensive and extensive hearings will put a light on what options remain for America to start bringing our troops home without trading a dictator for chaos. Most of that sounds pretty good. Talking is always better than not talking, and political solutions should be arranged directly by those who are affected by them, not imposed by outsiders. But something a blogger with the nickname of American Mick said in another discussion made me pause. Iran is primarily Shiite. Syria is primarily Sunni. Each of them supports militias on the respective side of that fence. I have believed since Saddam Hussein was deposed that the only real end to hostilities in Iraq would be cooperation between those two countries in brokering a truce, and the total withdrawal of westerners. The result would be a fiercely anti-American coalition government rife with distrust. I don’t think it’s at all inappropriate to say America wants to have some of its own interests represented here and to say what those interests are. We should expect a government in Iraq that can get along with our government, as Germany and Japan did after WWII, and as the Balkans did.There are way too many governments in the world that make political hay by merely being anti-American, without making any contribution to any policy discussion, in order draw attention away from domestic problems and keep the ruling party in power. My lifelong ambition to vacation on the Euphrates seems even further from reality. Thanksgiving: an immigration cautionary tale? This week my students were winding down for the holiday and the vocabulary list got shorter. Pilgrims=peregrinos. Indians=indios. Thanksgiving=dia de dar gracias. Students were showing off their command of American slang by discussing who was a turkey. As I wrote on the board, “In 1620, the Pilgrims came to America from England… The Indians helped them ….” I started thinking about the Indians’ immigration policy. That first Thanksgiving, it was turkey all around, but I seem to recollect the Indians didn’t do so well after that. Pulling out that authoritative source of travel wisdom, the Insight Guide to New England that I once carried to read on a flight out east, I dredged up the chapter about the Puritans and the Indians. Sure enough, the Puritans took it on themselves to convert the Algonquin from their heathen ways, but first they quarreled with their non-Puritan fellow Europeans. After several Quakers were hanged, Rev. Roger Williams declared from the pulpit that “forced worship stinks in God’s nostrils,” and was exiled from the colony for his sentiments. He founded a colony in Rhode Island, which welcomed Quakers, Jews, and French Huguenots. And yes, the Bill of Rights was inserted into the Constitution at the insistence of Rhode island. At first there was enough room for everyone. There had been about 16,000 Indians in New England at the time of the Mayflower. A third of the Indians had died in a plague in the 1600s. By 1660s a fifth of New England Indians lived in “praying towns” along the Connecticut River and near Cape Cod–where Indians had their own “preachers, teachers and magistrates”–.and were expected to give up their language, religion, and all cultural customs. The Puritans, however, were unable to make all the Indians into neo-Europeans, and increased population pressures led to the outbreak of war in 1636, ending with the demise of the Indians in King Philip’s War by 1676. Contrast this with the welcome given several centuries earlier to the Viking settlers at Vinland. The Vikings came on a people they named ’skraellings’. At first the Vikings traded with the skraellings, but when the trade goods ran out, things got ugly and several vikings were killed by skraellings. Although the vikings had a settlement in Newfoundland complete with boat houses and an iron smelt, after that unfortunate brush with the skraellings, the Vikings left the new world altogether. Now, here’s something to ponder as you carve up that turkey. Who had the most effective immigration policy: the Algonquins or the Skraelings? Posted in Curiosities, English as a Foreign Language, English as a Second Language, ESL, Government, Immigration. Comments Off on Thanksgiving: an immigration cautionary tale? Imagine there’s nothing to kill or die for. Those are the words of John Lennon’s song, Imagine. Former U.S. President Jimmy Carter is known for many things. He started Habitat for Humanity, an organization that builds affordable housing. And many say he was not re-elected because of the Iranian hostage crisis. The American public perceived Carter, a Democrat, as weak in foreign policy, they say. Instead they elected Republicans Ronald Reagan, and later, George Bush. These days Carter travels around the world monitoring elections. What were those song lyrics again? Debbie Elliott: International groups are monitoring the Nicaraguan election. Hundreds of observers from the Organization of American States, the European Union, and the Carter Center are on hand to observe the vote. Former U.S. president Jimmy Carter himself is in Managua and joins me now. Welcome to the program, Mr. President. Jimmy Carter: Well, it’s good to be with you and all the folks who listen to NPR. DE: Have observers there found any problems so far? JC: Well, minor problems. I went out early this morning before the polls opened and we were there when they did so. We were able to observe 24 voting sites before we came in for a press conference in Managua and there were some delays at the beginning because the officials are so meticulous and careful that it takes them a long time to get started. But once the lines started moving, they’ve been moving quite well. DE: Why is it that groups like yours wanted to be in Nicaragua for this vote? Were there indications that there could be some trouble there? What exactly were you there to look for? JC: Well, I personally and the Carter Center have been here for three previous elections beginning in 1990 when the Contra War was still in progress. And that was a very controversial election and a lot of violence around the country. And we were back here for two more elections subsequently, and so this is our fourth election. We’re very interested in this country because it has had its trouble and a controversial past. But the people seem to have resolved their problems and I think almost universally throughout their population, they’re now deeply dedicated to both democracy and peace and obviously economic progress. DE: Again Mr. President, I’d like to talk to you a little about this election and elections in the past. What were the issues in the past? Was it violence, was it intimidation, was it polls not being available to all the people? And how is that different today? JC: Well in 1990, for instance, the country was highly polarized between the Sandinistas and leaders who had been revolutionaries along with Daniel Ortega who were running against him. And as I said in that case the United States was still waging the Contra War against Nicaragua and in fact there were more than 40 counties up near Honduras that couldn’t even vote because the Contras were still fighting the Sandinistas. And so that was a troubled time, and that was when the Carter Center was most deeply involved here just to bring a peaceful election. Obviously, the Sandinistas lost by about 12 percent, and I stayed here for three or four days after that to negotiate between the winners and losers so they would accept the results peacefully and graciously. In 1996 and later in 2001, there were a lot of problems in the central election commission, actually disqualifying candidates who were qualified in our opinion. And that was a problem that was resolved, there was some very difficult vote counting. But I think almost all of those past problems have now been corrected. The Carter Center has had six delegations here beginning in January to observe the elections of a local nature and also elections along the Caribbean coast. And so looking at the results of those elections and the procedures in each case, the Supreme Electoral Council has corrected almost all the problems. So I think this present election is very likely to be much better than we’ve seen in the past. DE: Can you describe the change in the atmosphere, say, between one of those elections just after the war and today’s election in Nicaragua? JC: Well, of course the dominant factor in Nicaragua has been the rise and fall and then the rise and now the contention of the Sandinistas led by Daniel Ortega. And, as you know, the United States government has done all it could in recent years to prevent Ortega from being elected, and they have expressed a strong preference for other candidates who opposed him. This has been equaled I would say on the other hand by the fact that the leaders from Venezuela have seemed to prefer the election of Daniel Ortega. DE: In fact, President Chavez has actually offered cut-rate gas and fertilizer to Sandinista officials there. JC: That’s correct. They have authorized the distribution of some oil through the government itself headed by President Bolaños, and also fertilizer at a low reduced price to some of the farmers, and, in that case, the Sandinistas distributed the fertilizer. At the same time, the U.S. government through its ambassador and through other representatives have publicly condemned Ortega and endorsed other candidates. DE: …And even said that the U.S. might stop aid to Nicaragua and that people might even be cut off from money that their relatives working in the U.S. are sending back home. DE: Mr. President, how does that pressure affect the voters there? JC: I think in general it’s counterproductive. I’ve seen not only in Nicaragua but in other countries, particularly in Latin America, when the United States tries to interfere in an election by condemning a candidate, that condemned candidate sometimes becomes stronger. That happened in Bolivia as you may know. And sometimes when they endorse a particular candidate it looks like that candidate represents a U.S. government instead of the people in which he’s running. And so I think it’s counterproductive to try to interfere in the affairs of a political nature in a sovereign country. DE: Should the U.S. be concerned about the prospect of an Ortega presidency? JC: Well, I’m not sure. This is our 67th election around the world. We have experience in many different kinds of elections. And I don’t think there’s any doubt that Ortega has attempted to change his reputation. In the past, for instance, the election, say in 1990, his colors were red and black, his symbol was a fighting rooster, and his words were very harsh. This time his campaign manager is his wife Rosario, and now the major colors on his billboards are pastels, and his major appeal is to peace and reconciliation. He endorses a principle of free enterprise instead of socialism. So he’s tried to change his attitude in the public’s mind, and whether he’ll succeed we won’t know until the votes are counted. DE: I’ve read where he’s using John Lennon’s “Give Peace a Chance” as his campaign theme song. JC: Yes, that’s true. And of course, as you know, in many countries around the world — my wife and I have visited about 125 countries — you hear John Lennon’s song “Imagine” used almost equally with national anthems. So John Lennon has had a major impact on some of the countries that are developing in the world. DE: Now, the Nicaraguan government changed the election rules this year, seemingly making it easier for Daniel Ortega to win without being forced into a run-off. Is that fair? JC: Well, it was passed with the approval of the people and their parliament. And there had to be other parties involved in addition to the Sandinistas. Yes, it’s an interesting… if you get 40 percent, you win. If you get 35 percent, you win, provided you’re five points ahead of the next candidate. So that means that there are going to be some very critical numbers that have to be considered when the votes are counted. The 40 percent, the 35 percent, the 5 percent difference. And then you got another very complex question of who is the second candidate? So you might have four different numbers to be determined that could make a very interesting outcome. DE: After your time spent there observing what’s going on, do you believe the Nicaraguan system is up to the challenge of these kinds of numbers and this kind of meticulous detail? JC: Yes, I think so. Not only do they have a very competent election commission that has, so far, proven to be fairly well balanced, not 100 percent, but there are thousands of international observers here and more than 10,000 domestic observers that are completely familiar with the rules and regulations and nuances of the voting procedure. So I think it’s going to be a carefully watched and monitored election results. DE: Do you feel like all of the voters are getting an equal opportunity to cast their ballot? JC: Well, as you know, the officials in the voting places have to be from different parties, at least three different parties. Secondly, the party observers that stay inside the voting place all day long and the four major parties in all 24 places that we visited this morning, four parties were represented so they’re watching closely, everything that happens. The other thing is that the final tabulation is observed just as closely, and both the officials representing free parties and the observers have to sign the tabulation sheet. So if there is a subsequent question, then the tabulation sheet has been certified by everyone observing. So it’s a much more careful and meticulous process and much more uniform throughout the country than anything we’ve ever seen in the United States. DE: I know that your organization monitors voting in many different countries. DE: But with other international groups there in Nicaragua today, was there a reason that this particular election is drawing so much attention from observers? JC: Well, it’s not extraordinary. We’ve held election in Palestine three times. We’ve held elections in Mozambique. We’ve held elections in Liberia. This past week, we monitored the run-off election in the Republic of Congo. I would say that’s the most complex election we’ve had. We’ve done two elections in Indonesia, the Carter Center has, and at that time, we had 120,000 observers. So although there’s a lot of interest here, depending on the size of Nicaragua and the number of people who are voting, about 3 million, I think it’s primarily because of the past concern about the Sandinistas. And whether they’ve changed their basic policies or whether they’ll have success in their election… that still remains to be seen. DE: What is your opinion on that, do you believe they’ve changed their policies? JC: Well no, it’s obviously a different rhetoric. Much more moderate, as I said earlier, committed to reconciliation and peace. Pastel colors. Moderate statements. Commitment not to socialism but to free enterprise. I think only time will tell whether those new promises will be fulfilled. I can’t predict that. DE: Mr. President, one final question, if you will. Here in the U.S., we have a very hotly contested election on Tuesday that could change the balance of power in the Congress. Voters across the country are concerned here about the voting process. Some have expressed concerns about voting machines and whether they will be working, others have accused officials of trying to intimidate certain groups of voters. Is there a need for a poll watching system of outside observers at U.S. elections? JC: As you may know after the 2000 election which was a total debacle, President Gerald Ford and I headed a major blue ribbon commission and recommended changes in the voting procedures that largely were passed by the Congress. And then, after the 2004 election, which still showed some major problems, former secretary of state James Baker and I headed a similar commission and made some recommendations, very few of which have yet been implemented. But there’s no doubt in my mind that the United States electoral system is severely troubled and has many faults in it. It would not qualify at all for instance for participation by the Carter Center in observing. We require for instance that there be uniform voting procedures throughout an entire nation. In the United States you’ve got not only fragmented from one state to another but also from one county to another. There is no central election commission in the United States that can make final judgment. It’s a cacophony of voices that come in after the election is over with, thousands or hundreds of lawyers contending with each other. There’s no uniformity in the nation at all. There’s no doubt that that there’s severe discrimination against poor people because of the quality of voting procedures presented to them. Another thing in the United States that we wouldn’t permit in a country other than the United States is that we require that every candidate in a country in which we monitor the elections have equal access to the major news media, regardless of how much money they have. In the United States, as you know, it’s how much advertising you can by on television and radio. And so the richest candidates prevail, and unless a candidate can raise sometimes hundreds of thousands or millions of dollars, they can’t even hope to mount a campaign, so the United States has a very inadequate election procedure. DE: I think an unprecedented more than $2 billion has been spent on advertising this year. JC: I would say that neither the Democratic nor the Republican Party would consider seriously a candidate to be president who couldn’t prove in advance that he or she could raise $100 million. That’s a gross travesty of what democracy ought to be, and I hope that someday our nation will change those rules. 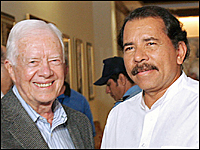 DE: Former president Jimmy Carter, an observer of today’s presidential election in Nicaragua. Thank you so much for being with us, sir. JC: I’ve thoroughly enjoyed talking to you. Thank you very much. What would it take to make a world where there was nothing to kill or die for? 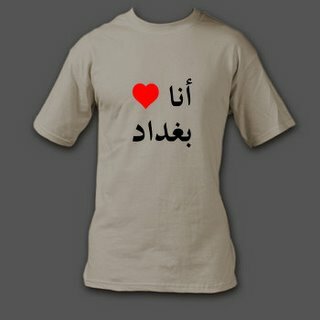 By request, a new T-shirt that says in Arabic “I heart Baghdad” for a co-worker who knows someone serving in Iraq. T-shirts are sweatshop free and ethically produced. In addition to the popular “We will not be silenced” black T-shirt, pronounced “lahn nesmit”, also in Arabic language. How do you spell habeas corpus? And which amendment was that again? Don’t forget the Bill of Rights. 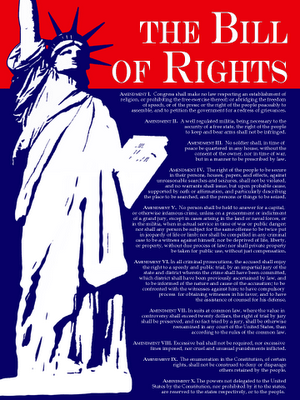 If you are a public school teacher you can get a free poster with the Bill of Rights sent to your school address. All you have to do is promise to put it up in a classroom or hallway. UPDATE: As of Novermber 2006, the Progressive Patriots now say they will send a poster to anyone. Another update: They say they are out. People who ordered these did not recieve them. The first of November is not just the end of Halloween. It’s the beginning of National Novel Writing Month, that literary marathon where writers all over the world try to complete a 50,000 word novel by the end of the month. 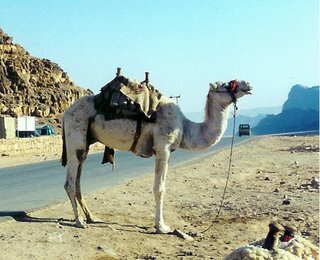 Okay, I admit I’ve always wanted to write a novel, maybe a pithy bestselling potboiler with bedouins galloping across the desert in their landrovers, but what does it actually take to write 50,000 words? If you do the math, it works out to 1667 words a day. Some say you can write 500 words in an hour, which would mean writing 3 hours every day in order to finish in a month. Others say it’s closer to 800 words in an hour, which means writing two hours a day. Here is an interesting thread with some discussion from people who have actually tried the challenge. I think I’ll approach this like a sport. There are indeed elite Olympic athletes whose lives revolve around their sport, just as there are some well-published novelists. But when you start a new sport, you don’t plan to run a marathon the first time. You just get yourself some good shoes, run out the door, and go around the block a few times to see how it goes. Then you try to feel good about what you did, and look forward to enjoying it the next time.